"With 3 rescues at the store, it was a busy and productive day for adoptions at PetSmart today :-) The other 2 rescues (ARF and Tracy's Dogs) only featured dogs. That kept the spotlight on our cats & kittens, which was great, but also made for a lot of barking and dog traffic in the store, which was a little challenging for our cats & kittens to deal with. Everyone did very well, however. We had 4 adults, 9 older kittens, and 14 young kittens at the event. Zowie was adopted by a family in Plainfield. They completed the adoption paperwork, but did not take him home yet, as we still need to complete the dog test with their 7 yr old Border Collie/Terrier mix. Chequita was adopted by a young couple in Oakbrook Terrace. This is their first pet together, and they were very excited. Razina was adopted by a lady in Woodridge. She will have a 3 yr old male cat as a companion. Angel was adopted by a man from Sheboygan, WI. He had a cat named Angel many years ago, whom he really loved, and was touched by Angel's story. Janse (young male kitten, not posted) was adopted by a family from Aurora as a companion for Reba, whom they adopted earlier. Finally, a hold was placed on Azalea (2 yr old brown tabby female, not posted) by a young couple, pending processing of their application. Many thanks to the fosters who brought their cats and kittens to the event (Judy, Heather, Bethany, Natalie, Robin, Dawn, Gillian, Maureen, Veronica, Sandy and Julie & Vey). Special thanks to the fosters who were able to stay and help out for some or all the event (Judy, Natalie, Dawn, Gillian, Veronica, Sandy and Julie & Vey). Many thanks to the volunteers for their help with the set-up and clean-up as well as during the event (Sara, Debbie, Lauren, Kevin, Erin and Alex). We had 17 cages at the event, so there was a lot of set-up and clean-up activity. Special thanks to Sara for her photography during the event. 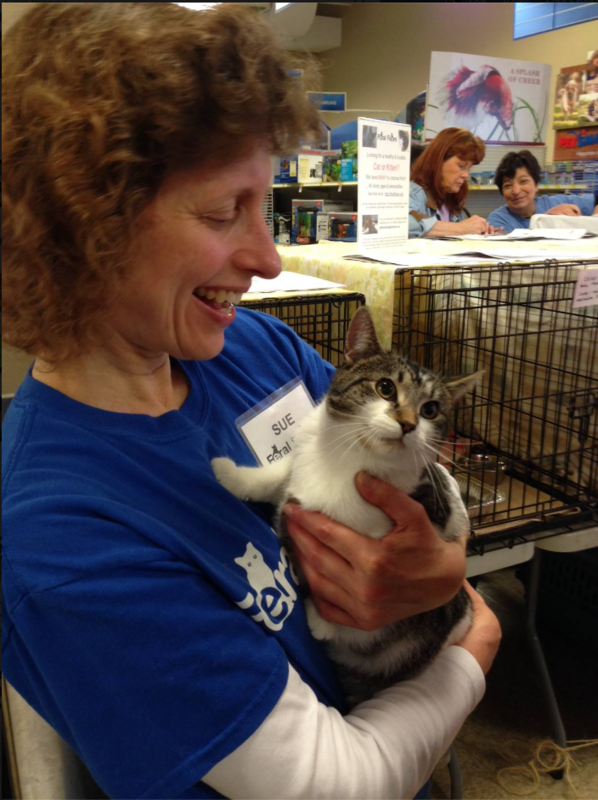 Special thanks to Debbie for transporting many cats to the event and updating the poster board. Special thanks to Lauren for contributing the Comfort for Critters blankets for adopters, a donation she has been providing for many months. Thanks, as always, to Mike for updating the binder of adoptable cats & kittens, and to Connie and Ted for the publicity of the event." Another great job and great day - thanks to everyone who helped out and made it all possible!